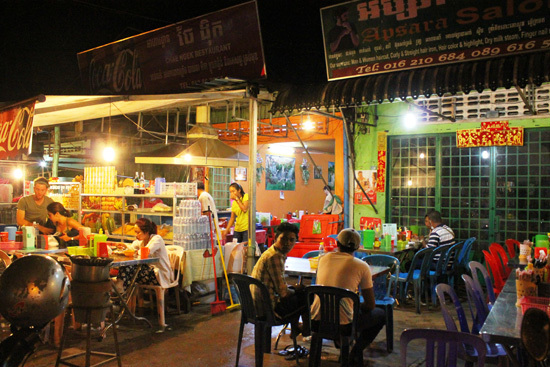 Siem Reap is full of restaurants but where to find very simple, very cheap street food? 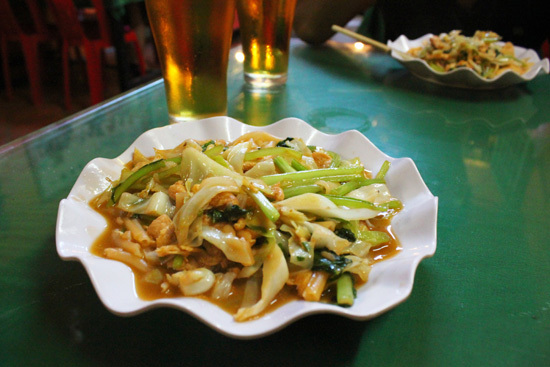 Eat with the locals at Chae Ngek Restaurant. In order to go truly local, you’ll need to remove yourself from Pub Street to find the street stalls. Opposite the Old Market come night time a few set up on the road — you’ll see the night market with its neon lights the other side of the river. They offer take-away, selling things like pancakes filled with banana or noodles. Don’t expect any chairs to sit on. Around two years ago, plenty of street vendors set up with basic outdoor seating at the end of Pub Street, but with increasing development, bars and shops have taken their place. Though they may have disappeared from the very centre, they never disappeared entirely. Rather, they upped and moved to a street off Sivatha Boulevard. Heading away from Pub Street, turn left at the traffic lights where you see Park Hyatt Hotel on the corner on your left. Follow straight down this nameless road one minute (by tuk tuk) and you’ll hit the local fare with several street vendors on both sides. With plenty of plastic chairs and basic tables, this is cheerful but not fancy. 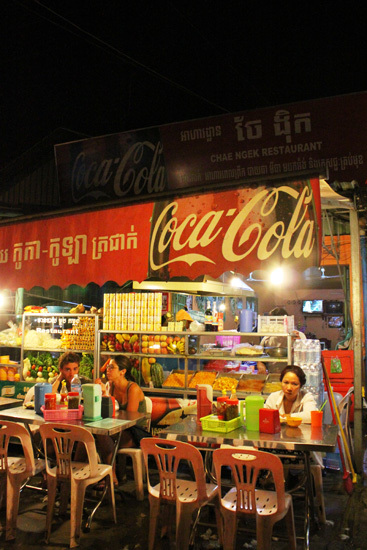 We have one particular favourite vendor on the left which we go to above all others mostly out of habit – Chae Ngek Restaurant, with the name is written on the sign above outside. The places don’t however differ much in either ambience or menus. It’s worth mentioning that tuk tuk drivers won’t know the names of individual restaurants – when we double-checked the name of Chae Ngek for some reason even the owner couldn’t remember it. Fill me up for US$1.50. The prices reflect the basic setup, with fruit shakes at 3,000 riel and noodle soup at US$1.50. Almost all the food is US$1.50 – including at least 45 items listed on the menu beginning with the word fried. Fried noodle, fried rice, fried meat, fried vegetables – and their many variations: mix meat with vegetables and you have a brand new dish on the menu! Due to their previous location in downtown Siem Reap they have kept their menus in English, making it very easy to order. The food is filling, portion sizes are generous, vegetables are fresh and we haven’t been able to spot them using MSG (but one can never guarantee this won’t be added at local restaurants). Flavours are simple – nothing too spicy, yet nothing too memorable. We recommend heading down here for value as a cheap eat – we can’t knock the price — and as a change from the busier tourist scene.